This is a large spider (females 9-20 mm, males 6-8 mm). The body colour varies greatly, but there are always four separate large white spots on the abdomen. The spider is found on vegetation which has sufficient height and strength to support the large orb web. 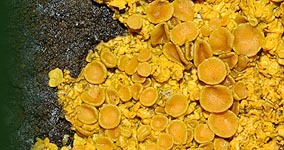 It lives in places such as undisturbed grassland, and on heather and gorse; it is not normally found in gardens. The web is usually found stretched across the gap between plants, and the spider can often be found hiding in a large tent-like retreat to one side. The Garden Spider (Araneus diadematus) can look similar, but the markings on its back usually form a more-or-less joined up cross-shaped pattern. Unlike the Four-spotted Orbweb Spider, Garden Spiders are often found in gardens and close to buildings, but they can also be found in the same habitat as the Four-spotted Orbweb. The Four-Spotted Orbweb Spider is the heaviest spider in the UK. Adults reach maturity in late summer and autumn, when the mated females can become very large as their abdomens distended with eggs. 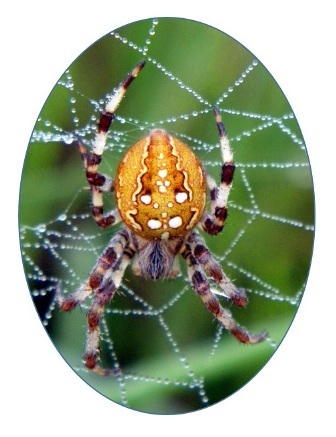 Follow this link for photographs of different colours of Four-spotted Orbweb Spider.